Frederick Wiseman is among America’s foremost documentary filmmakers. The recipient of many awards, including three Emmys, Wiseman has made more than thirty feature-length documentaries during a career that has spanned five decades. Together, these films provide a fascinating chronicle of American social and institutional life. 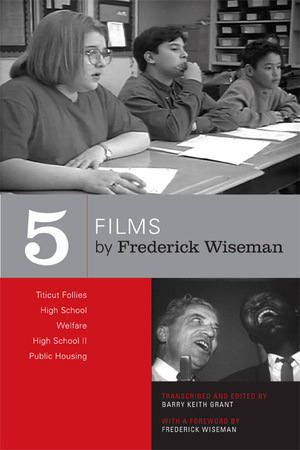 This book makes available for the first time transcriptions of five of Wiseman’s most important films— Titicut Follies, High School, Welfare, High School II, Public Housing—providing all of the dialogue as well as annotations about other aspects of the soundtracks such as music and ambient noise, and notes about editing and camera movement. These scene-by-scene transcripts enable readers to scrutinize the films’ complex structural patterns, recurring motifs, editing regimes, and the unscripted dialogue that makes Wiseman’s cinema a rich repository of American speech. Editor Barry Keith Grant’s critical introduction discusses the importance of sound in Wiseman’s documentaries. Liberally illustrated with images from the films, these meticulous transcriptions are accompanied by a bibliography and filmography. Barry Keith Grant is Professor of Film Studies and Popular Culture at Brock University in Ontario, Canada. He is the author of Voyages of Discovery: The Cinema of Frederick Wiseman (1992), and the editor of Fritz Lang Interviews (2003), Film Genre Reader 3 (2003), John Ford’s Stagecoach (2002), and The Dread of Difference: Gender and the Horror Film (1996), among other books.